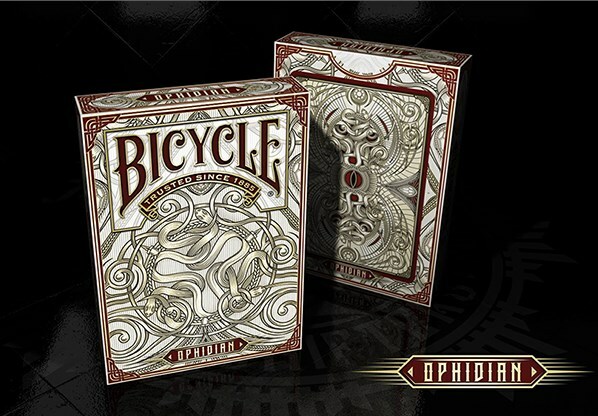 The Ophidian deck is named after the reptile suborder Opidia (snakes), and is a word that refers to snakes. Snakes alive! Sure enough, this deck is all about what its creators describe as "the hypnotic beauty of a snake". 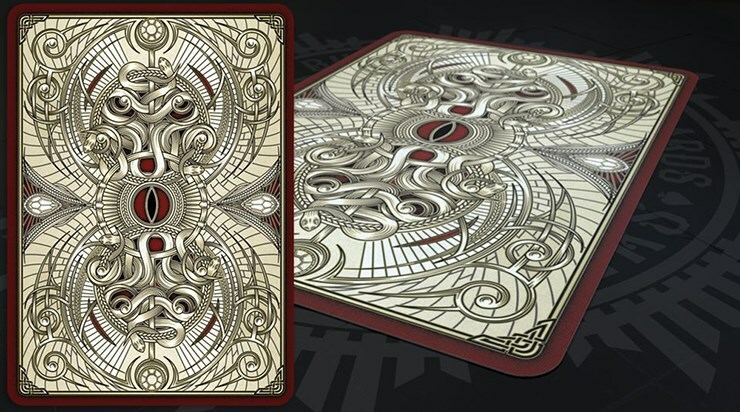 The artists at Shapeshifters Playing Cards have teamed up with Gambler's Warehouse to produce this elegantly designed snake-themed deck. The tuck box immediately introduces us to an intricate and artistic tangle of multiple snakes, with an engaging design that draws you in as you rove your eyes along the twisting shapes of our ophidian friends. The hypnotic design of these slithering creatures is also a key feature of the card backs, which are bordered in a reptilian brown. These are inspired by the classic rider back design in that they have two strong circular shapes that ensures a mirrored/symmetrical look. Yet within this traditional pattern is a detailed and intricate design that is highly original, and is full of intertwined patterns that closer examination reveals to be snakes. The overall background pattern also brings to mind the scales one might find on our reptilian friends. 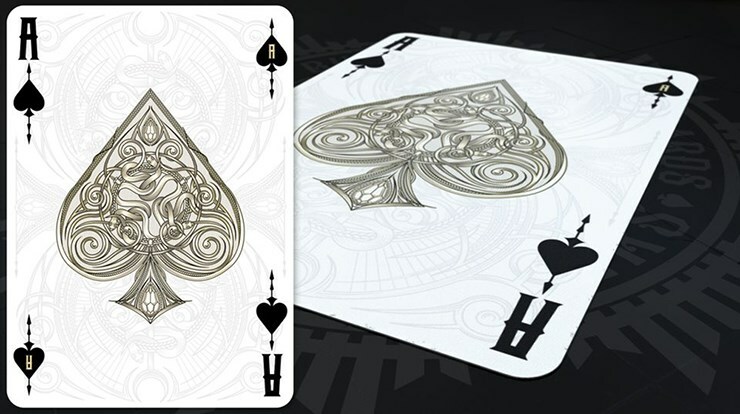 All the Aces are oversized, and reprise the highly detailed artwork found on the card backs, with entangled snake-like coils. The design of the card backs also returns on all the card faces in a faint watermark style. The overall design of the faces is also highly reminiscent of the style of the Mystique deck, which was also created by Shapeshifters. 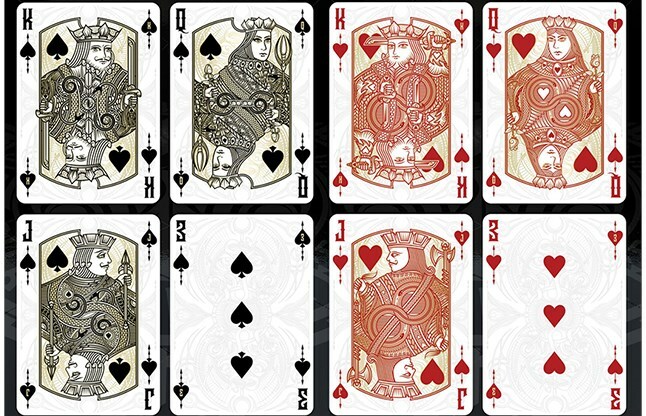 The court cards have a monochromatic look, in either black or red. While clearly inspired by classical court cards, they also offer a fresh and fully customized interpretation. A light yellow-brown serves as the soft background to the characters, and this colour complements the card backs nicely. Especially noteworthy is the use of "scales" as part of the design. Careful observers will also be rewarded by noticing lots of curled shapes, some of which turn out to be actual snakes. 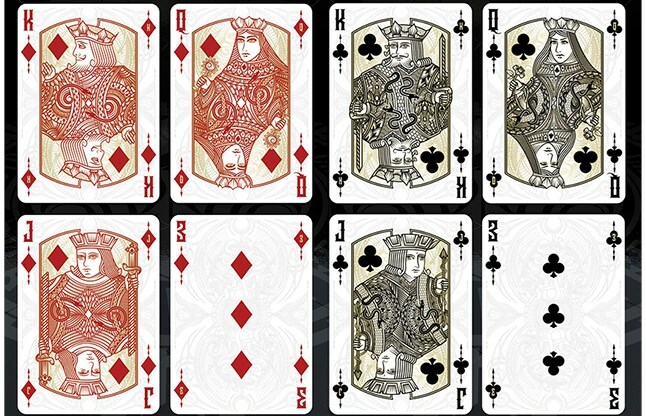 The number cards have a very bold look, highlighting the customized pips that are found on all of the cards. Especially noticeable on these cards are the use of pips on all four corners, which is an unique feature of the entire deck, as well as the arrows piercing the smaller pips used for the indices. 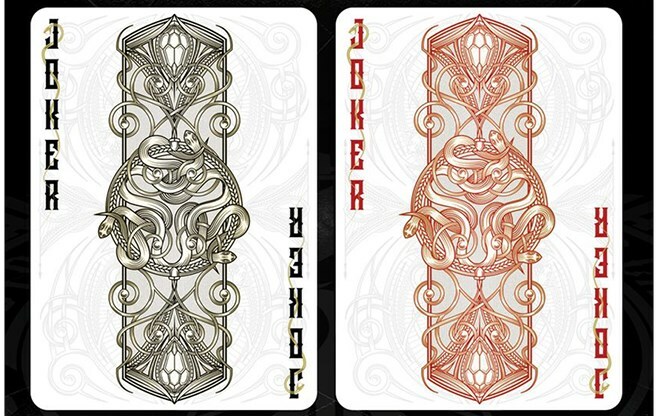 The Jokers complement the design of the card backs, but offer a completely new interpretation of the entangled shapes present there, with an hour-glass shapes that also incorporate ovals decorated with scales to look like serpent heads. The text of the words Joker also features a snake wrapped around it. This deck has been printed by USPCC, which means that the creative artistic vision of this project has been matched by a quality product that looks and handles great. Like all USPCC decks, it also comes with two extra cards, which are a diptych, i.e. when placed together, they create a single large image not altogether unlike the design on the card backs.